Let’s talk about heart attack and stroke causes and the complexity of the underlying coagulation (clotting) pathways. What a heady subject. You need a PhD in medical hematology, just to fully understand the complexities of coagulation. So let’s work through this step by step. This will be a multi part series. I will help you achieve a clearer understanding. None of us wants to suffer a heart attack or stroke! What causes these these catastrophic vascular events? What are the risks? What medications are commonly used? Why are they not necessarily the best or even the healthiest choice? Can we assess risk benefit ratios? And what are the natural herbal-based alternatives? Ones that can be just as effective with fewer side effects and less costly. This is what you will not hear from your personal internist, cardiologist or even family physician. 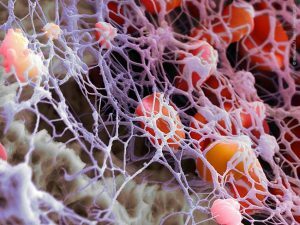 A blood clot usually starts with an injury to a vascular wall. This could be one of your arteries or veins. An intricate series of reparative or reactive events is set in motion. Your body tries to rapidly repair injury to the vascular wall. Atrial fibrillation is an alternative source of thrombus formation. In this instance, stasis and not injury, initiates the reaction. Fig 1 above shows you a representation of the well formed blood clot. It has the potential for blocking blood flow (vascular occlusion) which deprives tissues distal to the block of vital cell oxygenation. The medical term is myocardial infarction or cerebral infarction. Cells die from lack of oxygen. 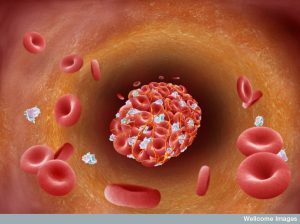 The initial early phase begins with activation and aggregation of platelets. Fig 2 shows you the beginning of the activated platelet aggregation sequence. 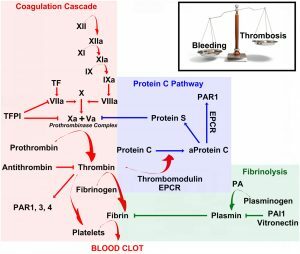 The final result of thrombus formation is illustrated in fig 3. An artistic rendering of the platelet-rich polymerized fibrin lattice. Now, I want you to look at this animated video of this rapidly evolving sequence of events. It will more visually summarize this first part. This two-minute video is well worth watching. Then we will move on to the individual steps of each coagulation pathway. Once we understand the sequence of events can begin to understand the rationale for various treatment modalities. Here is the classic series of reactions in the fibrin producing pathway. What a complex picture! Let’s see if we make some sense of this rich set of reactions. 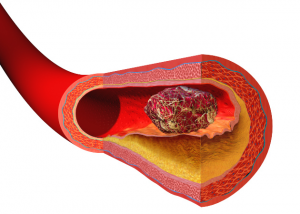 How does this affect stroke and heart attack (myocardial infarction) risk? First look at the pink box. That is the fibrin cascade. 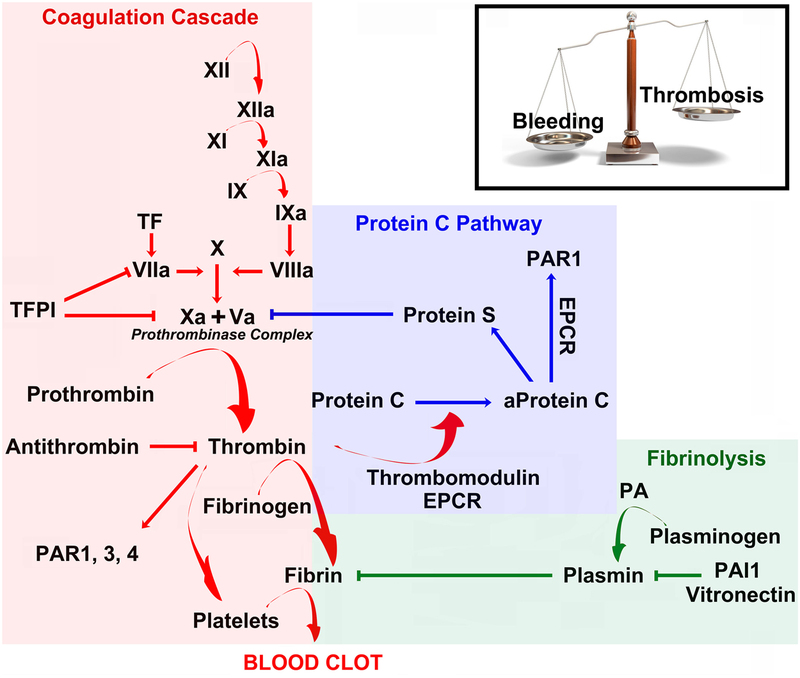 The common pathway is the activation of thrombin. This cascades to fibrinogen. Fibrinogen is converted to fibrin. Mono-filament fibrin is elaborated. It will become a fibrin polymer. This is not yet a mature thrombus (clot). We will talk about the platelet contribution in Part 2. We routinely measure fibrinogen in all our patients — every time. What is important in this diagram is the internal and homeostatic balance. Bleeding vs clotting (thrombosis) . There are various counter mechanisms to thin the blood. Your body has its own internal set of reactions. Now look at the green box. The most common is plasmin. Another is a less recognized but highly important PAI-1 (plasminogen activator inhibitor). The PAI-1 is susceptible to 3 critical genetic variations. If it is mutated, you will see decreased fibrinolysis (clot breakdown). This can accelerate thrombus or clotting formation. This diagnosis is frequently missed by most hematologists. It can be source of severe pulmonary embolus or deep vein thrombophlebitis. We will explain fibrin and platelet pathways in greater detail in Part 2.